Interesting how one thing leads to another. I was asked to participate in liturgical environment planning. Just for a season. Nothing official or formal. I think part of the plan was for me to learn a bit more about the faith I had awakened to as an adult. A little backdoor catechesis perhaps. Not sure at what point I became a regular team member. 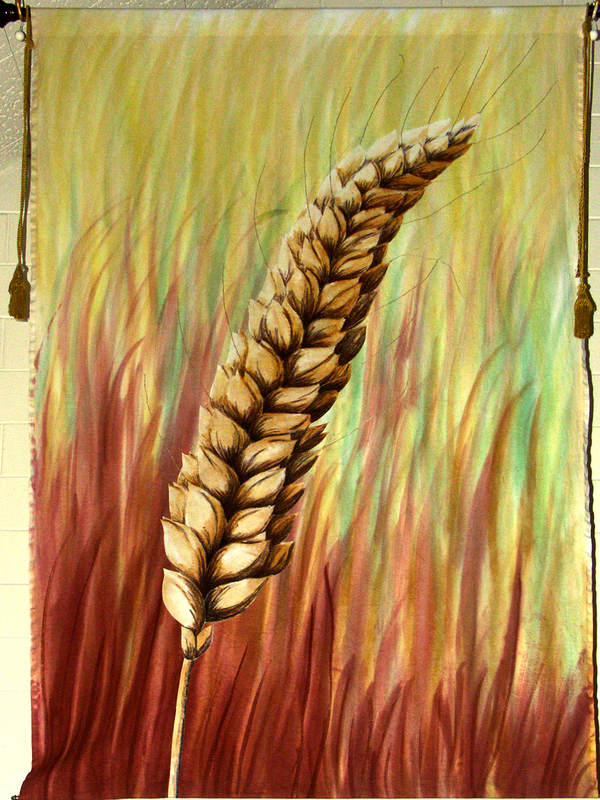 I spent many years that followed as a part of the liturgical design team in our local parish. Liturgical environment planning involves reading sacred scripture for the applicable period and designing the way the surrounding environment will look. The key to designing sacred space for worship is presenting an environment that supports and enriches the written word without adding to or detracting from it. Using brainstorming notes from the liturgy team, and the colors designated for the season, I would bounce ideas around and watch faces for the tell tale sign of ah ha. Sometimes using imagery, sometimes just color and shape, but always the surrounding area is designed to invite into the story. A successful design will awaken the listeners to the fullness of sacred word spoken. An unsuccessful one will leave them perplexed. I realize now, this was the first time I illustrated. It was also the first time I publicly presented art other than photography. A seed planted long ago was nurtured. I imagine the process is the same, regardless of your faith tradition. People have been illustrating the sacred since before it was written word. Should you have the chance to participate in such an endeavor in your personal faith tradition, I encourage you to do so. You may find it to be enriching, rewarding and enlightening. You may even come a bit closer to bliss. 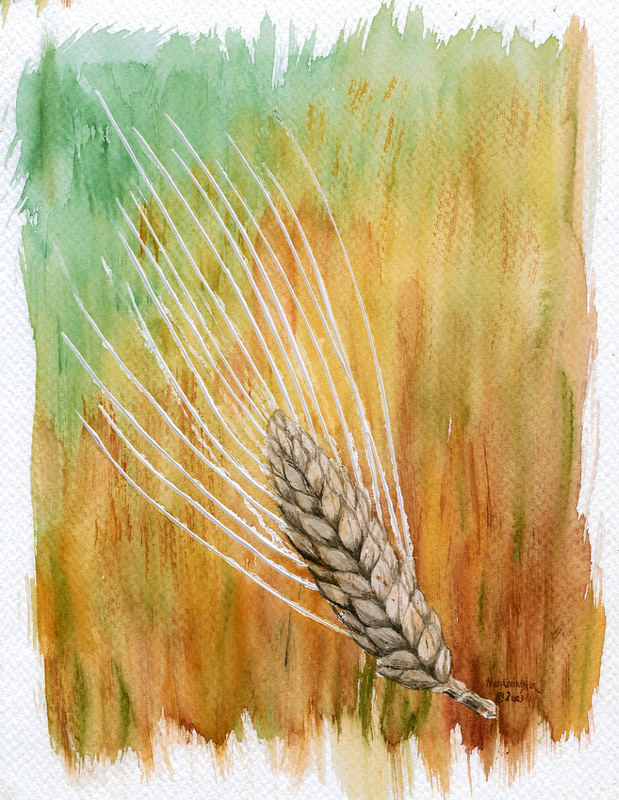 This entry was posted in Illustrations, Influence, Learning, liturgical art, Personal growth, Reflections and tagged Back door openings, Christian, faith, harvest, Inspiration, liturgical art, Planting Seeds, Sneaking Bliss, Watercolor, wheat by MaryALivingston. Bookmark the permalink. Beautiful painting, and it is funny how God works through us to get the results he seeks. Beautiful colors! I have never tried dies before but you encourage me to do so. Thanks! Thanks, this was the first time I tried using dyes like this. Now that I am gaining more experience I would like to use that medium again. Indeed, you are. It does hang in the house. The other hangs in church from time to time. Sensitive but strong, lovely piece. Thanks, Alicia, you know how long I danced around this. Having friends like you share their work is an inspiration. What a wonderful backstory. I’ve been doing a Christmas cover for a diocesan newspaper for quite a few years now; it’s a great feeling to use one’s talent to build up the Church and one’s religious faith, even in a modest way. Thank you. Six months ago I finally picked up brushes. Before then, I can count on one hand the times I dallied with watercolor. This was one such time. I think many people have art on the side, I certainly enjoyed reading about your journey to becoming a commercial illustrator. Will we be seeing a post with your Christmas cover?